Now I know that Japan is not the only country with a variety of tea beverages, but in Japan they really try to capitalize on the seasons when it comes to perishable products. 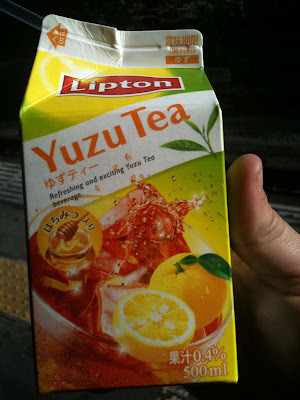 One prime example is the Lipton Brand iced tea available at any convenience store in Japan. Each season has its own harvest of a certain fruit, from grapes, apples, oranges, strawberries, pears , and so on. These flavors of tea are available but only for a limited time. This time limit brings a sense of shortage and a feeling that you have to "buy it now" or you will have to wait till next year to drink it again. This is especially frustrating if you like that flavor iced tea, but that means you will enjoy it all that much the next time it is available. I am not sure of all the reasons why they do this but it seems to be the Japanese way of business, and is perhaps very effective and profitable. The same goes for snacks, fast food, and many other foods and drinks. The label 期間限定 (kikan-gentei) or "limited time only" is a mark you will see very often in Japan. Buying with the seasons becomes part of the rhythm of life, as you await the unveiling of the next season and the products that come forth. It is an interesting difference from my own country and how usually most products are ready available year round (If they are popular). In Japan it doesn`t seem to matter, popular or not, once the season is over you can`t buy it at all! That's pretty interesting... I am an avid tea drinker but have not been so adventurous in the herbal/fruity tea arena. It's quite a good marketing ploy, except it sounds like they should do repeats of the seasons every now and then so people could rush to get their favourite. I noticed that there are English writing on the box. Is that common? Yep Conrad! In fact there is probably as much advertising done in English(roman letters) as there is in Kanji or Japanese! Very interesting! I really enjoy your blog, but the advertising has taken over your pages. While trying to read some of your past posts, pop-up ad's often take me to another page filled with even more advertisements. Perhaps you could limit the amount or discontinue Google AdSense...for it would make this blog a much more enjoyable read. Wow, living in Japan must be awesome, but crazy at the same time! Good business policy. When something is always available it doesn't seem that special. People always like to have something to look forward to. it's a refreshing post. let's drink to that.